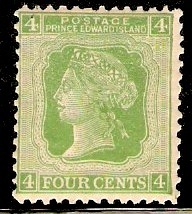 Prince Edward Island 1862 4d black. SG16. 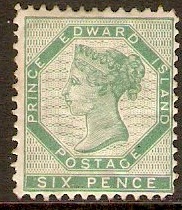 Prince Edward Island 1862 6d blue-green. SG18. Mounted mint 1862 6d blue-green. SG18. 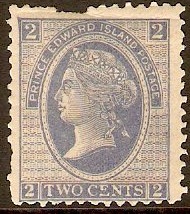 Prince Edward Island 1872 2c Blue. SG38. Some damage 1872 2c Blue. SG38. Missing perfs along top of stamp. Prince Edward Island 1872 4c yellow-green. SG39. Lightly mounted mint 1872 4c yellow-green. SG39.